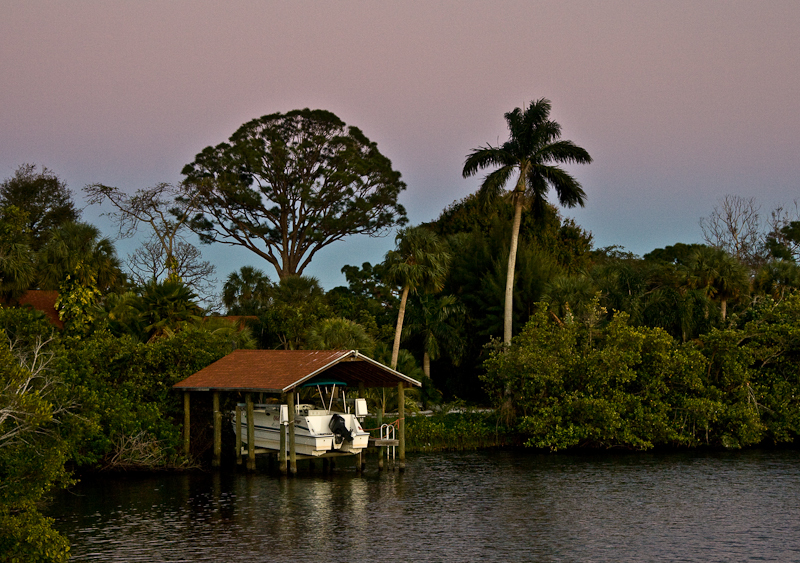 This shot is taken from a small bridge looking out over Manatee Creek. The place my parents are renting is just off to the right on the other side of this creek. There were many pretty sunsets but without a cloud in the sky it didn’t have that dramatic feel to it. The last night I was there we went out for dinner and sure enough there were clouds in the sky that really spread the light and colors of the sunset. Unfortunately, I wasn’t able to catch that sunset. Instead I was waiting for a table at the Catfish House. It’s a very rustic restaurant (bathrooms are outside, around the side of the building) but the food is amazing. There’s almost always a wait but it’s definitely worth it. I had a great meal of broiled catfish and sweet potatoe wedges. We make sure to hit this restaurant every time I visit. Beautiful scene and light. Whereas I have absolutely no palm trees around here, seeing shots like this, make me miss summer and green in general. Beautiful light in this shot…I love the old rusted boat shed, this image has great atomosphere!